Supporting adolescents, families, adults and groups. Please call Nancy at 603-731-3904 for a free initial phone consultation. both of which ho﻿ld keys to th﻿e solutions they are seeking. I work with clients to understand their unique experience and strengths and help them identify ways to reach their goals using those strengths. With intent and support, I believe everyone can get to a better place in their lives. I have faith in the process—a process that goes beyond the office walls. And I have a sense of trust in my clients to grow towards knowing who they are. I admire seekers because they are comfortable with questions. It is an honor for me to be with people as they experience a safe place in which to explore their thoughts, experiences and questions. My approach to therapy is to listen with an open mind to what people say they want to achieve in counseling. My goal is to be with them, reflect what I hear, validate and respectfully challenge when that is needed. When I begin work with a client, I focus on what is important to them. I am also open to the unexpected turns that therapy can take. Even when the goals are set, the process happens as we work together. It can be incredible. All the little insights that make a difference in people’s lives. Epiphanies are for movies. In real life it’s about the smaller steps, insights, and increased awareness that bring about changes we seek. My specialties include working with adults, adolescents, and families. I am an EMDRIA approved therapist (see EMDR.com for more information about this empirically based treatment for trauma, anxiety and depression) and an EMDR consultant in training. I continue my work with EMDR approved consultants, Dr. Deborah Korn and Ana Gomez. I offer consultation to other therapists, in particular those who are trained in EMDR therapy. Reduced rates for those working for non-profit organizations are available. My professional training includes solution-focused family and individual therapy, psychodynamic psychotherapy, behavioral therapy, EMDR therapy and group therapy. 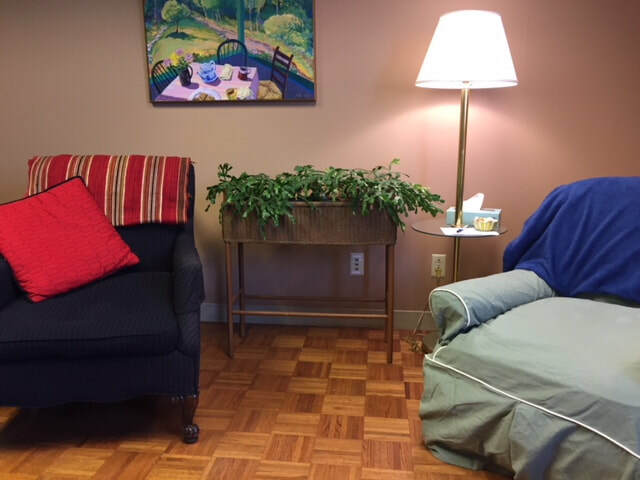 I offer short term counseling for those who are goal-focused and longer term therapy for those seeking increased self-awareness in process-oriented therapy. spans over 30 years, and includes working as a psychotherapist in a community mental health setting for 12 years; counselor in a private day school for two years; and counselor in a public high school for 13 years. I opened my private practice in 2013, offering services to adults, teens and children. Take NH-16N to Rt. 11 toward Alton/ Lake Winnipesaukee. Follow Rt. 11 to the Alton traffic circle, bear right toward Wolfeboro, Rt. 28 N. Turn right on Center Street/Rt 28) toward Ossipee, NH. Clarke Plaza is on the right. Follow Rt. 16 S to Rt. 28 toward Wolfeboro. Turn right onto Rt. 28, to business district in Wolfeboro Falls. Office is located in Clarke Plaza on the left.